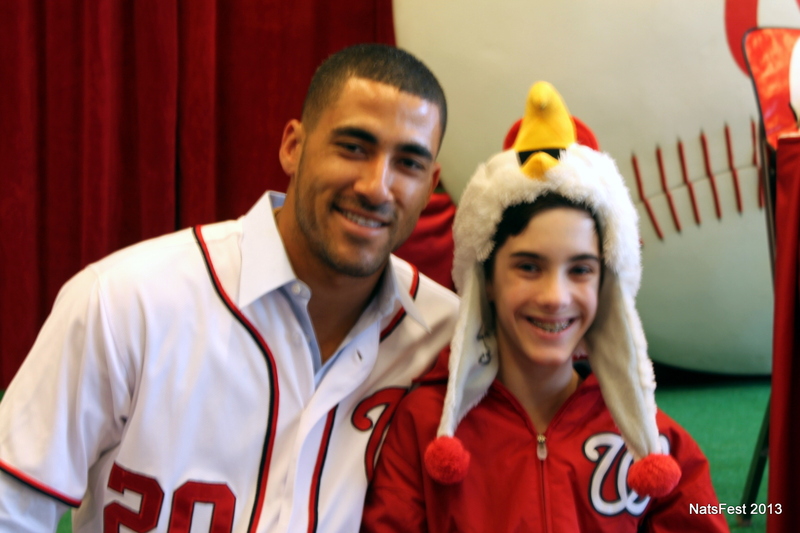 If you knew us or were following my blog a few years ago, you may remember a story about my son — a then 7th grader and connsumate Nationals fan and aspiring baseball annoucer, who got teased about wearing a Screech hat to school. He blogged about it, then I blogged about it and sent it out on my twitter feed. 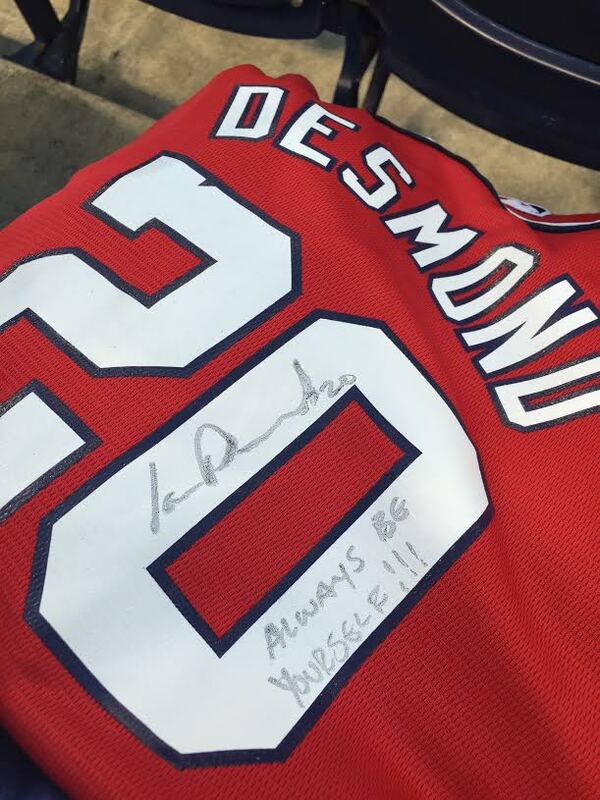 Much to my surprise, Ian Desmond, short stop for the Washington Nationals, responded to my tweet, telling Jake to bring it to Nats Fest and he would sign it. We went to Nats Fest, Screech hat on head, and I prayed that we could somehow pull this thing off. You can read the whole story in my follow up blog, but the bottom line is, we managed to not only get the hat signed, but also this amazing picture and a pep talk from Ian. It was a great story. But it didn’t end there. Last year, we were at Nats Fest, Screech hat on head, and Jake spotted Ian in a photo line. We didn’t have tickets for that particular line, but we stood at the perimeter and Jake yelled out Ian’s name. He looked over and saw him and stepped out of line to come over and shake his hand and say hello. He asked him how things were going at school and said it was nice to see him again. It was an awesome moment. I so often think of that quote when people have somehow wronged me (or I have perceived that they’ve wronged me). I need to remember to think of it when people have shown me that they are caring, wonderful people, too. Again, the tricky part was going to be pulling it off. I decided our best bet was to upgrade our regular seats on the 300 level to seats behind the dugout. 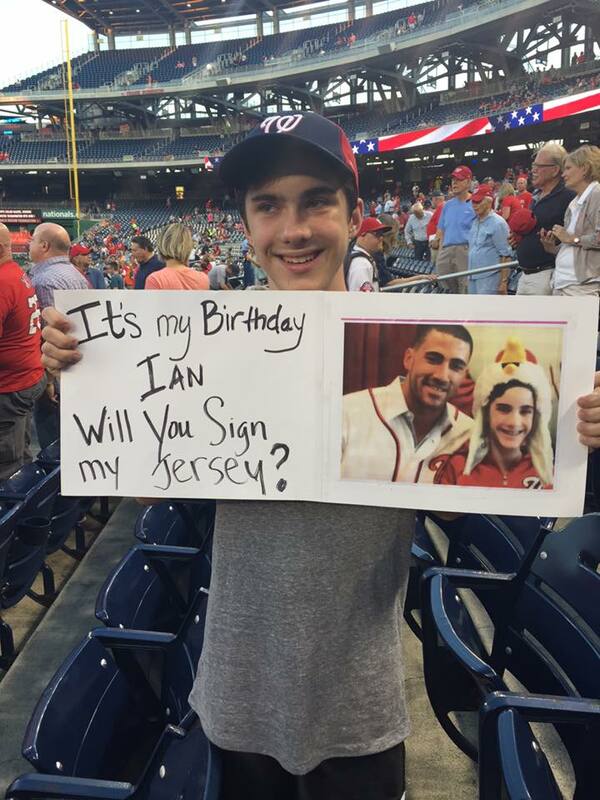 I ordered the jersey, made him a sign and let Ian know that we’d be there. At this point, there was nothing else to do. We arrived at the park early, had a dessert-first dinner at The Red Porch and headed down to the seats as the pre-game festivities started up. 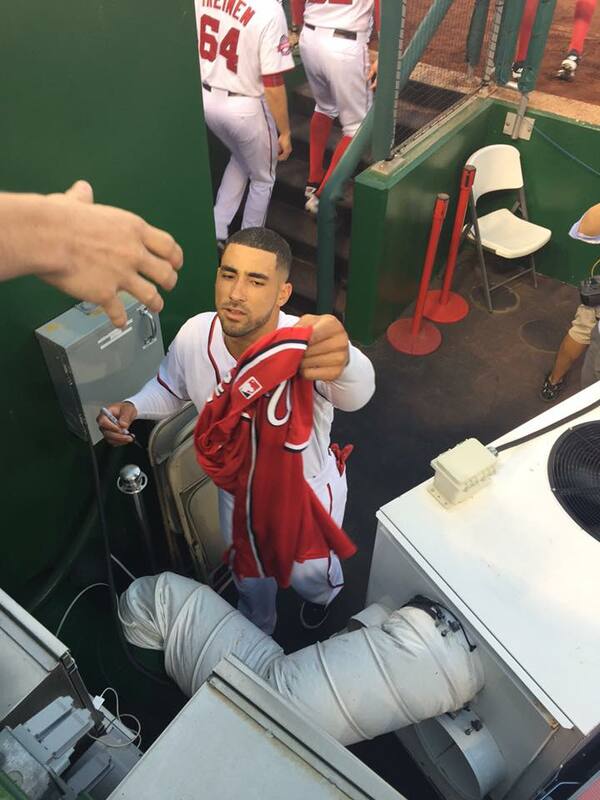 Jake ran ahead of us, so I didn’t see how things played out, but when we got down to our seats, he was stripping off his jersey and throwing it down into the dugout. 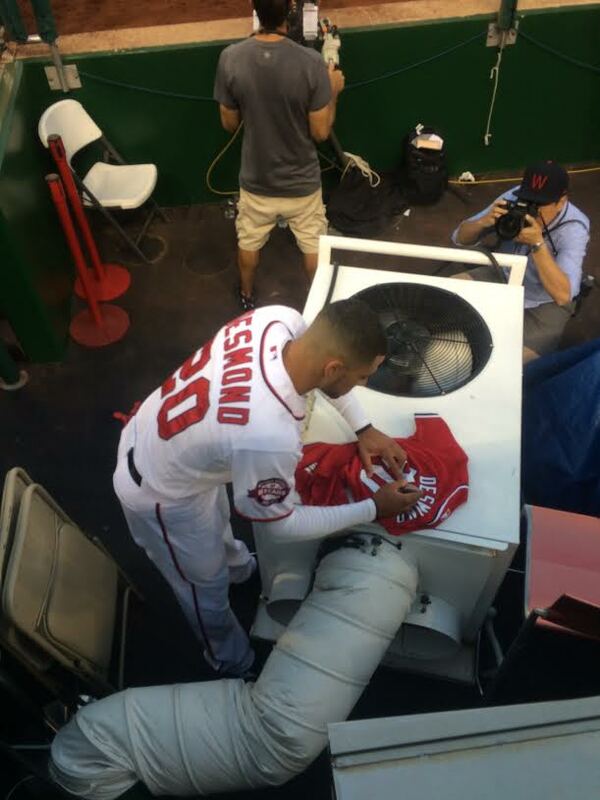 It’s become clear that Ian Desmond will not be wearing a Nationals jersey next season. 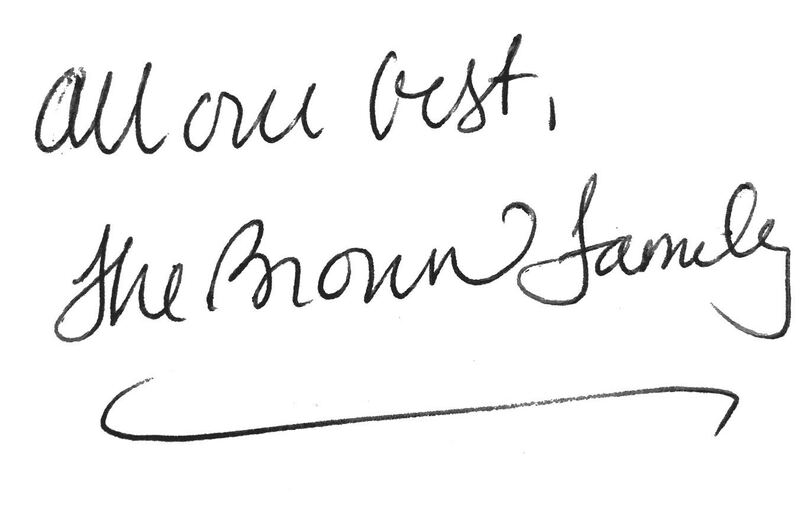 We have known this was coming for a while, but reading his parting words to fans, made it real. It’s baseball. 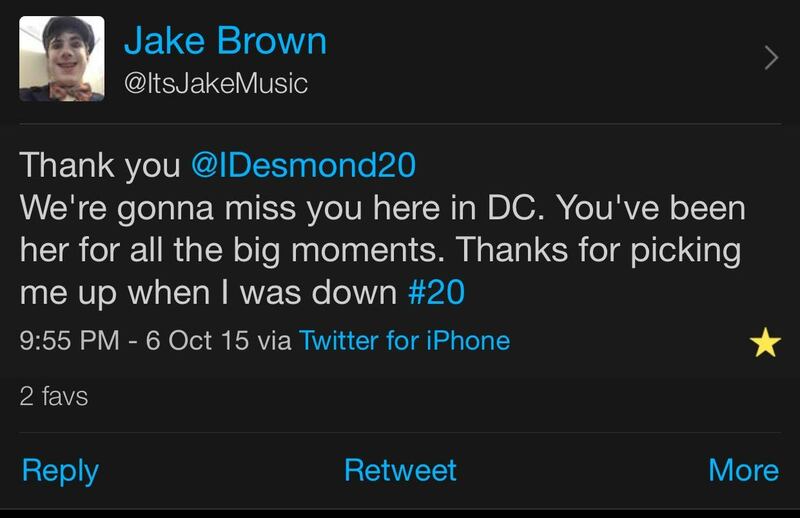 Players come and go…it’s all part of the game. But, this time…it stings a little more than usual. 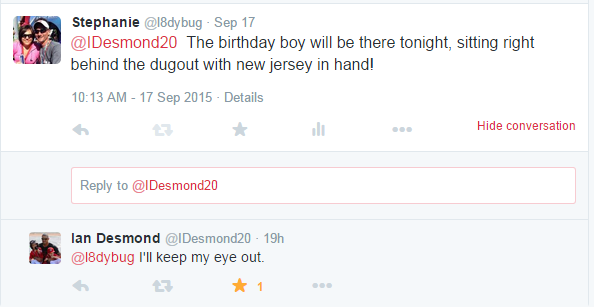 Thank YOU, Ian Desmond. Thanks for showing us who you are. — for the heart you showed on the field….for the leadership you so clearly showed in the clubhouse…for being a role model. And thank you for making a difference in the lives of your fans. Especially my son’s. We don’t know where you will end up…but the team will be so lucky to have you. And, our family will be amongst your biggest fans. P.S. Who knows….maybe someday the Screech Hat Kid will be calling one of your games. This will be his favorite story to tell. You named your baby “Derecho”? The storm that came through the DC area on Friday night has a name. It’s called a Derecho. I had never heard of it. It’s described as a widespread storm in which multiple bands of strong storms packing damaging winds move hundreds of miles. According to the National Weather Service Storm Prediction Center, their name comes from the Spanish word for “direct” or “straight ahead”, which is the way the storms typically move. The heavy winds, typically upward of 60 mph (and I think we had 90 mph winds), come from downbursts in storm clouds, caused by differences in the heat and density of air within the storm systems. There’s already a Wikipedia page for Friday’s storm and Capital Weather Gang is taking suggestions to name the historic storm. So far my favorite is Derecho en Fuego. But, what will be very interesting is to see how many babies are born in say…..March or April who are named Derecho. Or Derrick. Or some other derivative of the name. We are still without power in our neighborhood. We went to the house yesterday as we wanted to check on things and water the outside plants since the water restriction had been lifted. The house was stifling — 99 degrees inside. It was starting to stink, so we emptied the remains of the refrigerator and freezer — only to discover that we’d forgotten to empty the ice maker when we left on Saturday and it had melted all over the floor. The wood laminate floor, which will now likely sustain permanent damage. But, that can be dealt with. We drove around the neighborhood a little, just amazed at the destruction. Trees were uprooted everywhere. Others had just snapped in two. Some had landed on roofs and cars. Others had miraculously not fallen on anything but the ground. Electric lines were down everywhere. We realized how lucky we are that the enormous tree in our backyard, which is in dire need of either cutting down or trimming back, was still standing. A few branches had come down, but nothing had hit the house. It made the potential damage to the kitchen floor seem like nothing. And it is nothing in the whole scheme of things. It might cost us some money, but that’s okay. Our family is okay and that is the important thing. The power is starting to come back on, but people are growing weary and impatient. And, I don’t blame them. Not everyone is as lucky as we are to have a cool place to stay. People blame the power companies. And no…they are not perfect. There are things that could be done to help prevent things like this, but they cost money and nobody wants to pay for them. They also take time and people want instant gratification. Trees could be cut back, but people fight that, too. So there are no easy answers. What I do know is that the crews are working hard. Nobody is sitting in an air-conditioned room with their feet up on a desk, laughing at the misfortune of others and figuring out ways to prolong it. And, crews are working round the clock to get the lights back on. They’ve left their families in other states to come here — and it is a holiday week. They are working in unbearable heat and then many of them go home to their own dark, hot houses. Show them some respect. If you come across them in your neighborhood, tell them thank you. The system might be broken, but it’s not their fault. They are hard workers, making an honest living for their families. And in the midst of the frustration, we need to remember to take care of each other. If your power comes back on, invite people over who you know don’t have power. Even if you know that your friends and family without power are in a safe place, check on them anyway. I can tell you that it’s not easy to be displaced from your home. Just show them you care. Be courteous on the roads. Treat intersections without lights as four way stops. I know this is DC, but give your horn a break for a few days. Our nerves are all frazzled. You’ll get where you are going, I promise. Smile at someone today. Even if you don’t feel like it. They might really need it. Actually, I know they need it. We all need people to be kind and a little bit patient every day of the year. A smile goes a long way, even when there isn’t a natural disaster to deal with. And then, when the lights are all back on and our lives get back to normal….try to keep doing those things. Just an idea. 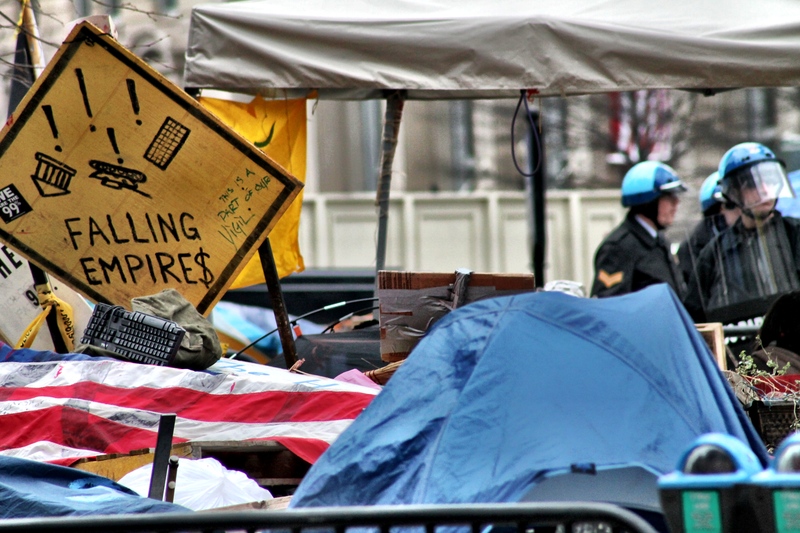 This past Saturday, the National Park Police moved in on the Occupy DC camp at McPherson Square to “further enforce no camping rules”. Jake just happens to have a class in a nearby building on Saturday mornings, so I wandered down to the park to see what was going on. 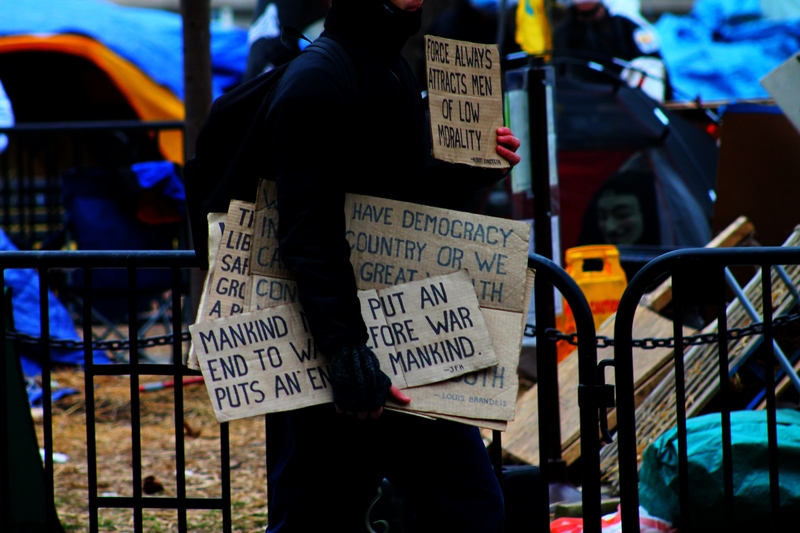 First some diclosure: I have not been an active supporter of the Occupy movement. 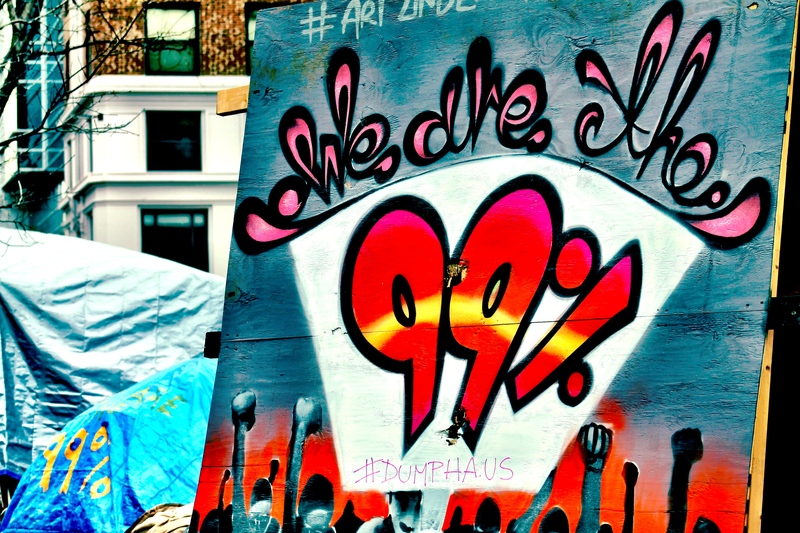 However, I do consider myself part of the 99% that they represent. I was excited when they first began protesting in October, but as the months have gone by, I just have never really understood what their goals are. And, this is often the complaint I hear from people. 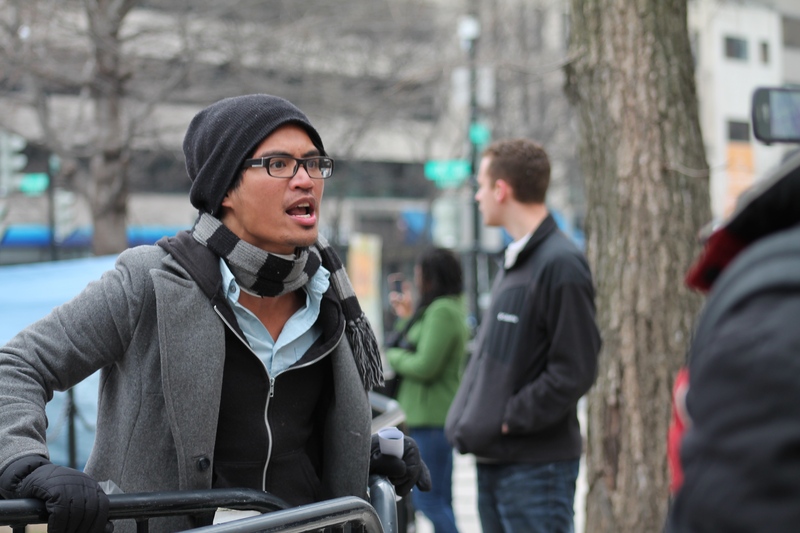 A few weeks ago, I was getting lunch in a restaurant adjacent to McPherson Square and a group of people from the camp were meeting. 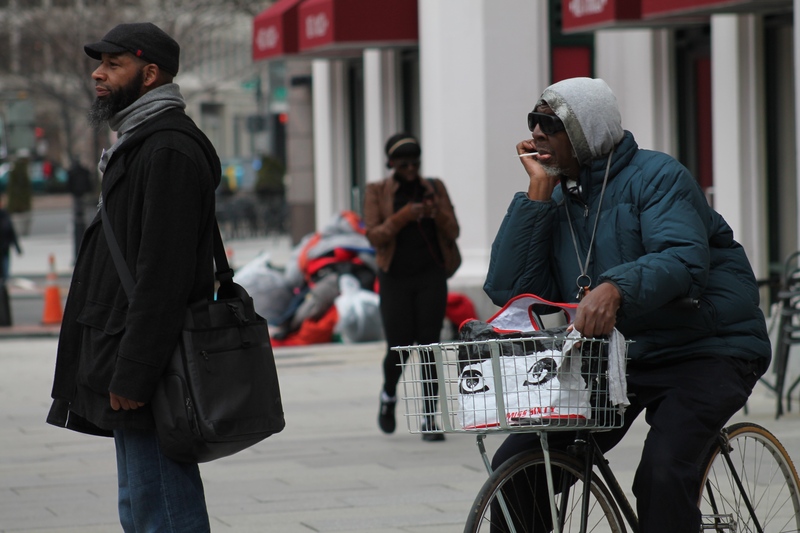 I overheard them talking about what their message was — and the responses were all over the place. That was nearly 4 months after they had arrived in DC. During that time though, from my standpoint, they have acted with civility and have generally been peaceful in their protests. 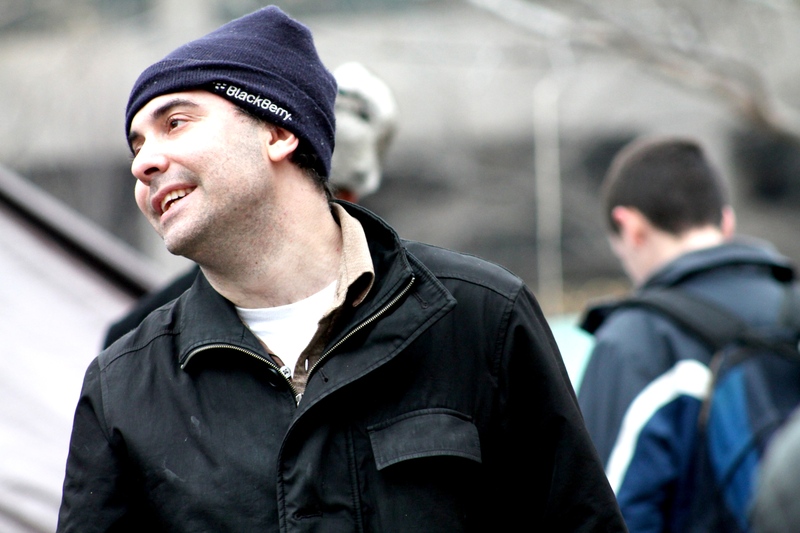 And, despite an appearance of not having a cohesive message (which, by the way, I know they would disagree with me on), what I do know is that there is a general unrest about the gap between the rich and everyone else in this country and that it trickles down into all areas of our lives. They are frustrated that people are accepting this as the status quo. And, I agree with these sentiments. I also am a strong believer in our First Amendment rights, so I while I have not been an active supporter of the movement, I would classify myself as a sympathizer. 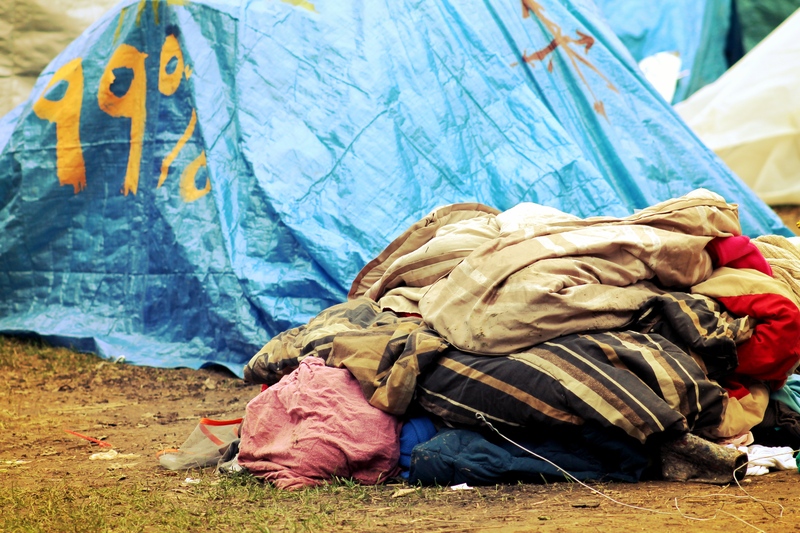 Piles of clothing and bedding taken from tents could be seen throughout the park. It gets complicated though when you start looking at how these long term gatherings begin impacting the surroundings. 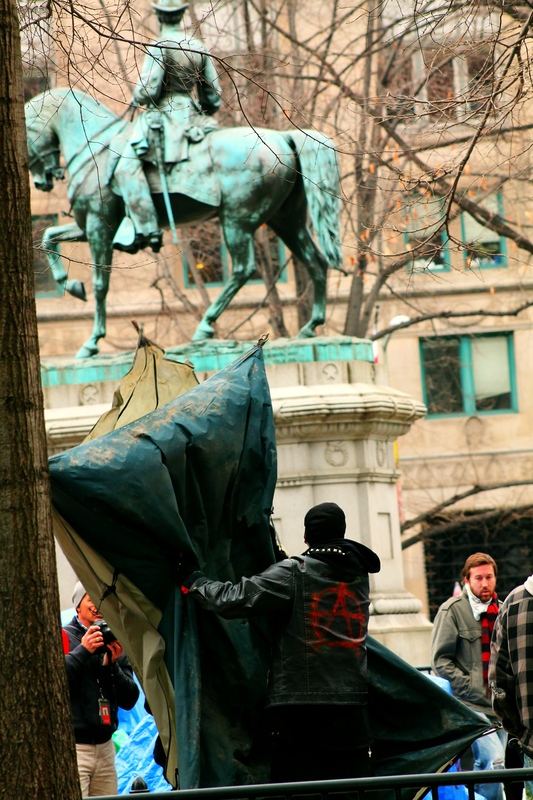 McPherson Square had recently undergone a lengthy makeover, costing nearly half a million dollars. The funds came from the federal stimulus package which directed money toward renovating National Parks nationwide. The park was beautiful, with new sidewalks and benches, grass and flowers. Now, after 4 months of people camping there, it is gross. And, DC residents are angry about it. I heard a guy, who was arguing with protesters yesterday make a comment that they were destroying “my city”. This was met with outcry as even I thought to myself that nobody can lay claim to this city. This is our nation’s capital. It’s everyone’s city. 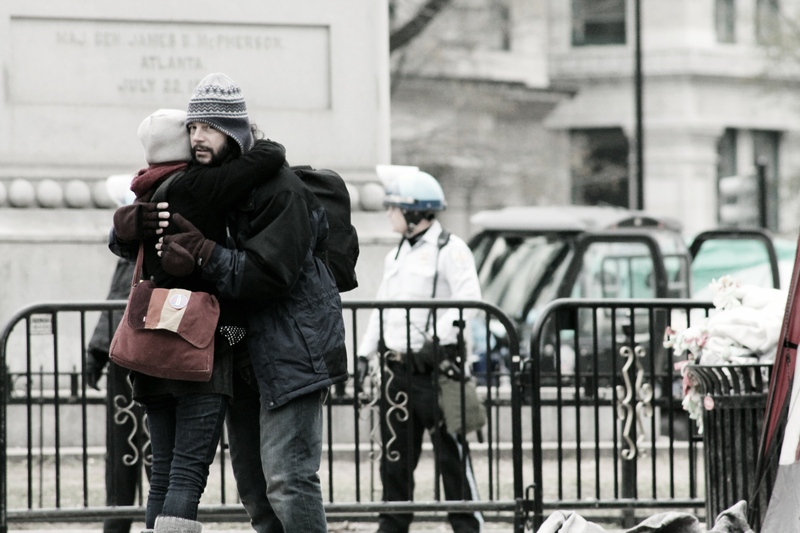 occupation is in itself an act of expression and is therefore protected by the First Amendment. 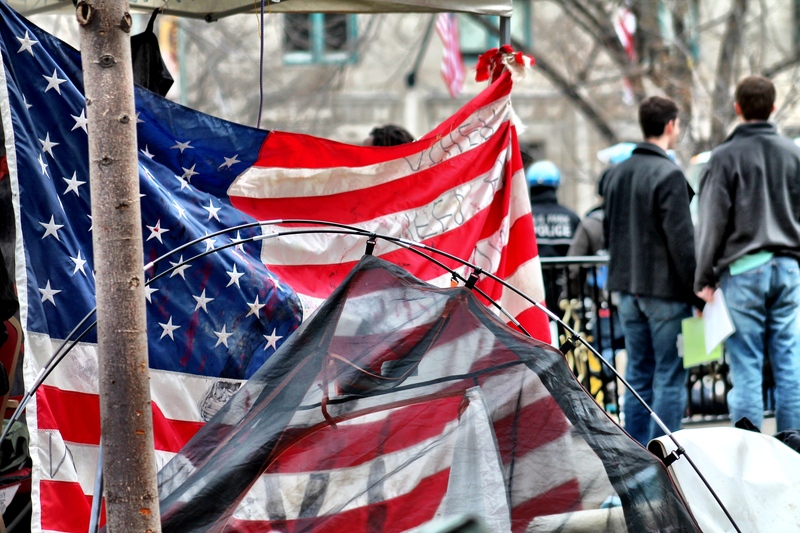 The Supreme Court disagreed though (based on a decision in a similar 1984 case, Clark v. Community for Creative Nonviolence) and the Occupiers were notified that the NPS would begin enforcing the no camping rules at the park. 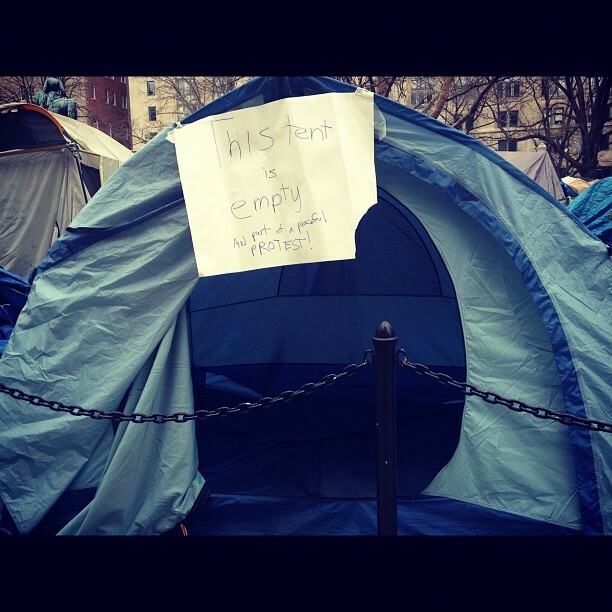 They claimed it would not be an eviction and that tents would still be allowed as long as nobody was sleeping in them. So, early Saturday morning, NPS police moved in to enforce those rules. I was not on the scene until about 10, so there had been a good 5 hours of activity before I got there. The streets around the park were closed off, but we were allowed to walk. Fences had been erected around the park, but at the time I was there, you were still allowed to walk around inside the park. There were piles of bedding, garbage and other items around the park and a group of people in hazmat suits were going through each tent. That seemed a little excessive to me, but reports are that there were dead mice and rats and other hazerdous material. 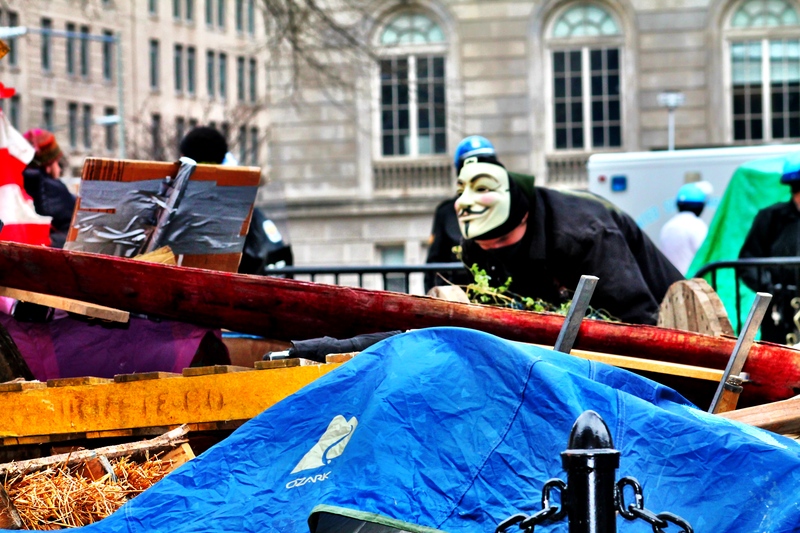 What was upsetting to the protesters was that there were empty tents that were being taken down. Protesters felt they had been lied to and from where I was standing, it seemed they had been. 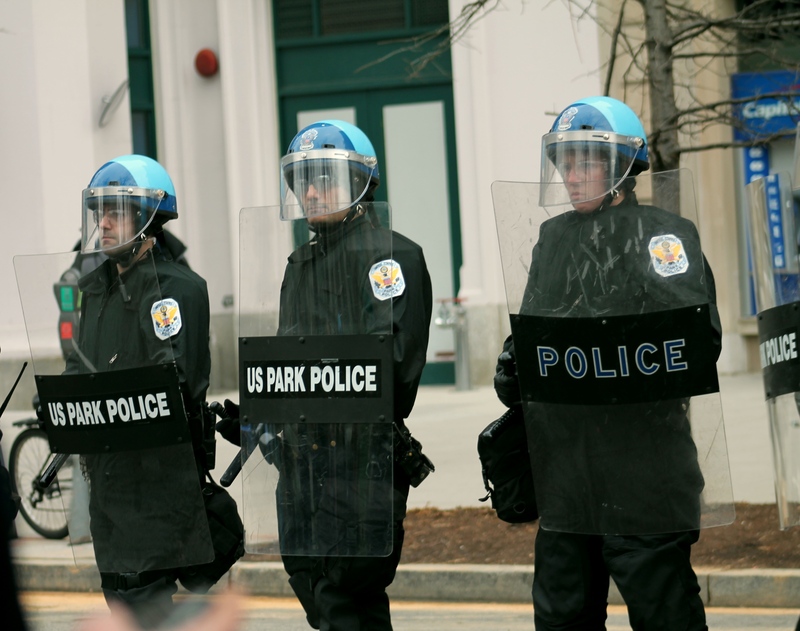 Additionally, there were police in riot gear who were stationed around the park, which also seemed excessive. I know that they need to protect the public and try to keep the peace, but these people do not have a history of violence. On the other hand, it seemed to me that there were a handful of protestors who were doing their best to encite police. They were screaming profanities in their faces and calling them obsenaties as they stood stone-faced. There were a couple of times that arguments broke out between protestors and onlookers and the police would quietly move in those directions, but as long as I was there, they did not interfere. In the hour and a half that I was on the scene, I did feel tensions begin to escalate, mostly on behalf of the protestors who were, I believe, justifiably frustrated with how this was all playing out. 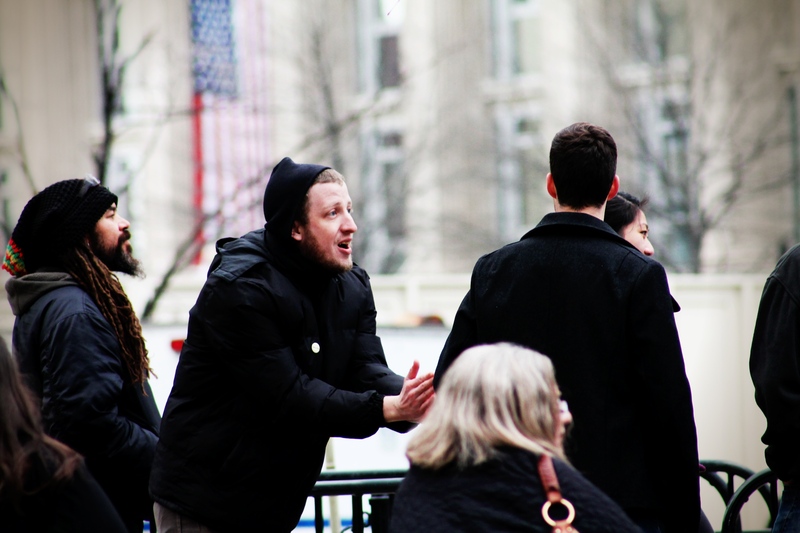 One of the more tense moments occured when an onlooker began heckling the occupiers. He said he considered himself a “1-percenter” although he clearly wasn’t. He simply had a different political point of view. 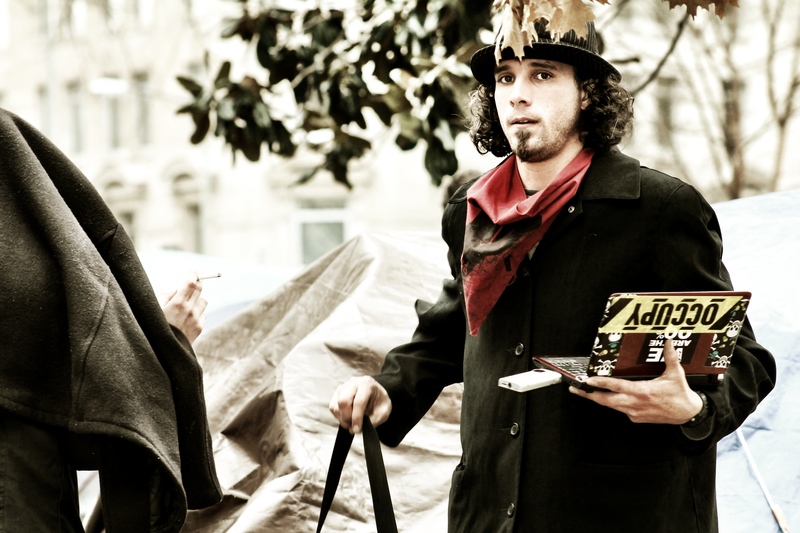 The thing is, the Occupy DC people are smart. If you are going to engage in a debate with them, you better be as smart and as quick or you will look like an idiot. This guy sure did. After I left and the day wore on, things began to deteriorate. There were several arrests and a police officer was taken to the hospital after having a brick thrown in his face. I don’t know what happens to the movement in DC now. 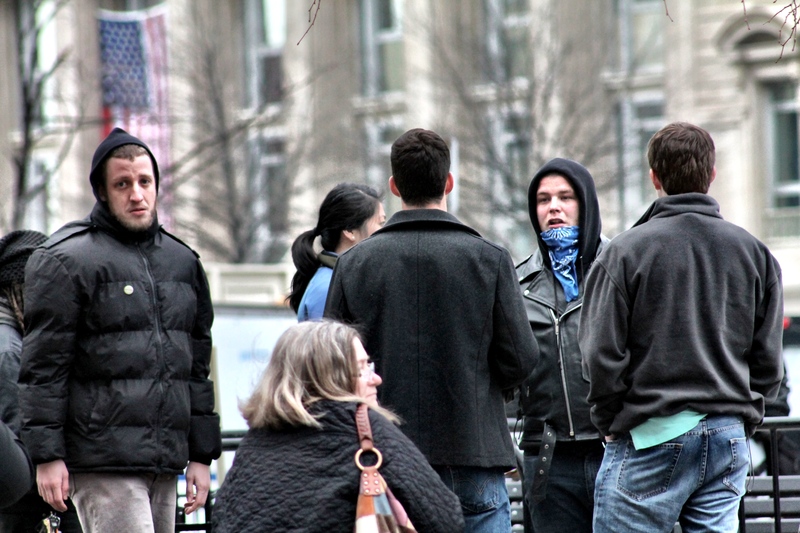 The Occupy folks sounded determined to continue, but I’m not sure how much more patience the public has. But, it is clear to me that they are driven by a sense of justice and that they care about this country and the American people. And each other. There are certain things I will never get tired of, living in the Nation’s Capital. Coming out of the Smithsonian metro station and turning around to see the Washington Monument is one. Visiting the Lincoln Memorial will never get old. And, I will always get teary when I see the World War II Memorial. But days like today make me feel like a kid on Christmas morning. This morning, the President will be speaking about his jobs plan. Right across the street from my office building. We recieved an email yesterday saying that there would be traffic delays and the street would be closed to pedestrian traffic for a time. I made an effort to get to the office a little earlier than normal and took a few minutes to survey the scene. Dump trucks are strategically parked on the Georgetown Waterfront, facing the river. 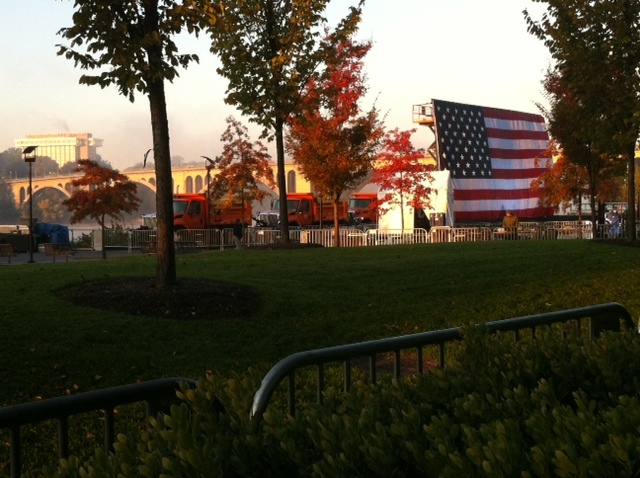 A giant American flag is hung behind the podium. 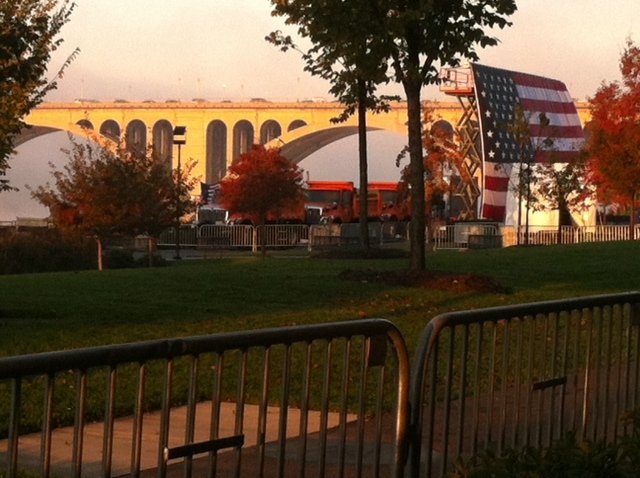 Key Bridge provides a beautiful backdrop on a stunning fall morning. The President’s Own Marine Band is rehearsing. 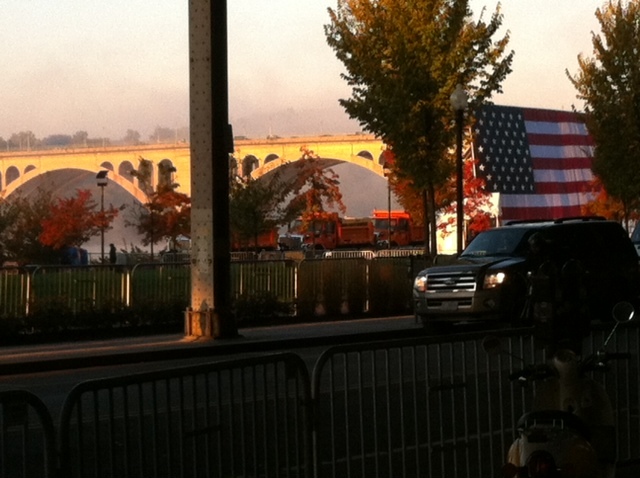 The Secret Service is giving me the stink eye as I stand there with my mouth gaping open, taking a few pictures. It’s moments like this that I try to take in and savor. These are experiences that very few people have. It’s not lost on me. People around me are complaining about the President ruining their lunch plans. But, I happen to think that it’s pretty stinking cool that he’ll be less than a block from my office entrance.